Six easy mac and cheese videos with recipes to make everyone smile. We love macaroni and cheese around here and enjoy experimenting with different recipes. For all of our mac & cheese lovers, we’ve rounded up these easy mac and cheese recipe videos to make everyone smile. If you want to enjoy a rich, hearty, and flavorful dish, you have to make our Stovetop Cheeseburger Macaroni and Cheese recipe, featuring Cabot Extra Sharp Cheddar Cheese. You’ll love the flavor the diced tomato brings and the heartiness the ground beef adds! Mac and Cheese in a Hurry? This instant pot mac and cheese creates the taste and texture you crave when enjoying this ultimate comfort dish. Looking to add some greens to your mac & cheese? The pairing of tender kale with our delicious Alpine Cheddar makes for a super creamy and scrumptious mac and cheese. Make this stovetop mac and cheese dish whenever you crave a perfectly delicious bowl of comfort food and share it with loved ones. It’s almost easy to make as the box kind, but it’s full of healthier ingredients and the great flavor of Cabot Extra Sharp Cheddar that your family will love. 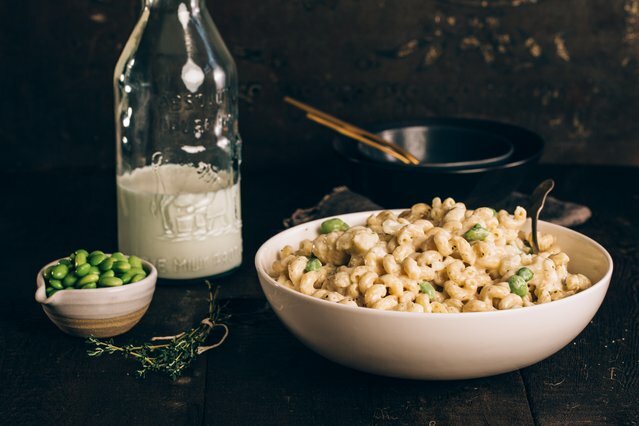 With both cauliflower and edamame being showcased in our Stovetop Edamame and Cauliflower Mac and Cheese recipe, you’ll get your vegetables and other nutrients all in one easy dish. Enjoy this cheesy Stovetop Edamame and Cauliflower Mac & Cheese now! Broccoli, ham and Cabot Seriously Sharp Cheddar make this stovetop Mac and Cheese recipe easy and flavorful. We have several easy-to-make stovetop mac and cheese video recipes. Our Stovetop Cheeseburger Mac & Cheese is a fun twist on our original, widely popular Stovetop Mac & Cheese recipe (also shown below). For mac & cheese dishes with some healthy greens, our Alpine Cheddar & Kale Stovetop Mac & Cheese includes kale, which perfectly complements the Cabot Alpine Cheddar Cheese, creating delicious flavor. And our Stovetop Smoked Ham and Broccoli Macaroni & Cheese is both hearty and nutritious. Want a mac & cheese recipe that’s hands off? You’ll love our Creamy Instant Pot Mac and Cheese. This recipe is extremely convenient and turns out perfectly luxurious mac and cheese every time. Made with three different cheeses, it’s full of rich flavor and makes the ultimate comfort food meal. Mac & Cheese "Carbonara Style" with Blistered Snap Peas is another fan favorite, with a delicious combination of Cabot Alpine Cheddar, Pancetta, blistered snap peas and fresh lemon zest. Our Pimento Mac & Cheese is another fabulous twist on the traditional recipe, incorporating Cabot’s recipe for the Best Pimento Cheese and smoked paprika into the mix. If you’re not confident in how to make mac and cheese, you’ll be a pro after watching a few of these video recipes! And when you want even more ideas and inspiration, check out our additional best macaroni and cheese recipes.